Port Townsend's downtown is designated as a United States National Historic Landmark District. Like many revived downtowns there are a number of souvenir and boutique shops, galleries and art shops, bars and restaurants. However you will be walking among mid-19th century buildings with live music being played in the parks and maybe street corners. We had a day of fun all starting with the Port Townsend Creamery first thing in the morning. Free samples of the most unique and interesting cheeses we have tasted in our entire existence. We bought a mini wheel of the Sea Stack and I have to say that I probably ate the majority of it. We parked downtown, walked in and out of shops before heading to the deck at Sirens Pub for lunch. After lunch we walked down the street to watch a local musician perform in the park. It's fascinating how many instruments one person can play with every digit and limb of their body. 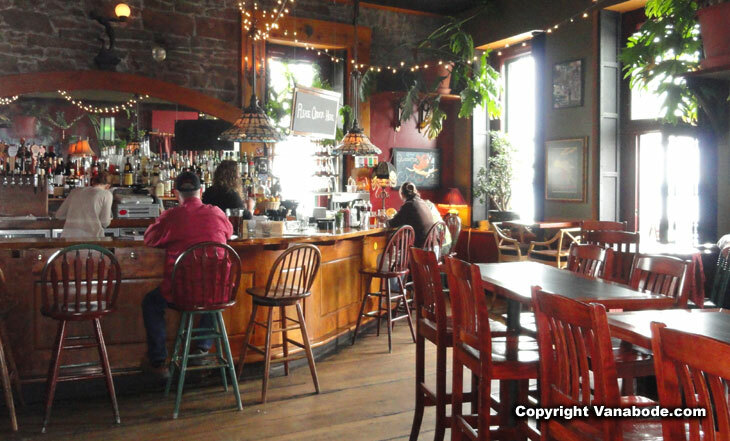 Above: Picture of the bar and restaurant of Sirens Pub in Port Townsend. To get to the restaurant you have to climb up the narrow and steep staircase, but what a great view at the top. Some of the menu items are unique and they use local ingredients. Jason had the steak sandwich and honestly I can't remember what I ate. I was probably still daydreaming of the Sea Stack cheese wheel in our Vanabode. A lady behind us couldn't get over how good the trio dip was. 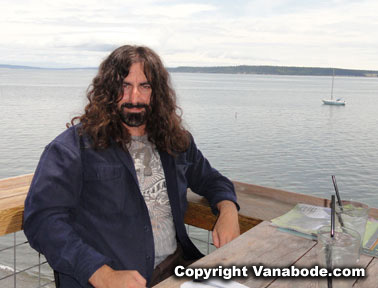 Above: Picture taken while eating lunch on the upper deck of Sirens Pub in Port Townsend Washington. The restaurant overlooks Puget Sound. In the distance is Indian Island and Whidbey Island. We saw a guy paddle boarding back and forth. 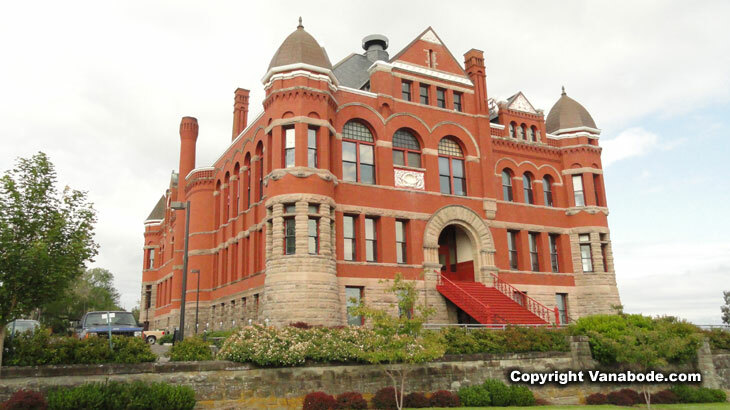 Above: Picture of the Jefferson County Courthouse in Port Townsend Washington built in 1892 complete with a basement jailhouse. Visit the nearby Olympic Game Farm which also has a rich history in theatre. While you are visiting the northern peninsula of Washington take a hop, skip, and a jump to Sequim and the Dungeness spit. Sequim (pronounced squim rhymes with swim) is the official Lavender Capital of the North America with 13 lavender farms. The fields are in full bloom in the middle of July and during the third week is when the annual lavender festival is held. The lavender scent wafting through the air is astounding and like no other you will experience unless you travel to Europe. Another one of my favorite bouquets found in nature is the forests of Sequoia and Kings Canyon in California. It's slightly similar to a christmas tree scent of a yankee candle but 1000 times more understated and natural. This area is also famous for Dungeness crab, season starts in July. Ahhh, a summer eating fresh crab overlooking the Strait with the people you love. You can take a quick drive around Dungeness Loop and check out the piers and camping in the Dungeness Recreation Area. Jetting out more than five miles into the Strait of Juan de Fuca is the longest natural sand spit in the U.S. It is also part of the Dungeness National Wildlife Refuge which can be reached via hiking the spit. So, just to make it clear how many miles your day will total if you walk to the lighthouse, 11. That's right 11 miles round trip and that may take you 4+ hours. That all depends on your speed and time you take for pictures and a picnic. If it's low tide then you can walk on the packed sand along the water line or a little higher up on the grey beach pebbles alongside large pieces of washed up trees, aka driftwood. However, during high tide this trek may find you climbing over driftwood with slightly wet feet. As with any beach venture on the coast of the Pacific Northwest whether its in Oregon or at Deception Pass check the tide charts before planning your day. 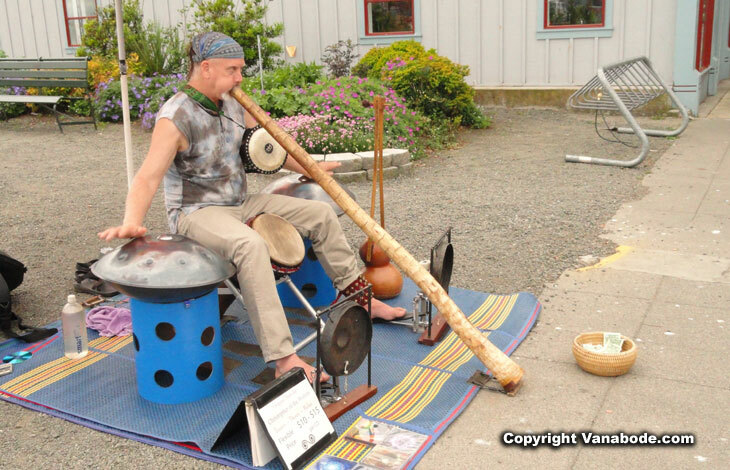 Above: Picture of the local street musician using every body part he can to make music. He had CD's for sale. He stopped and talked to us for a while about his music style and the culture of Port Townsend. The city's strategic location at the entrance to Puget Sound made sea travel of people and goods a first stop for vessels in the 1880s. But as money ran out for the railroad and the customs office moved to Seattle the city's population steadily dwindled. In the 1970s restoration efforts began starting with the Victorian homes and the buildings downtown. The now authentic and beautiful Victorian seaport's economy and culture is strong with maritime flavor and influence. There is an annual wooden boat festival, weekly regattas and races as well as movie and music festivals. It's definitely a day for relaxing and enjoying everything that a resorted pacific northwest Victorian town offers with natural flora and sea. You will not be disappointed with your visit to Port Townsend Washington.